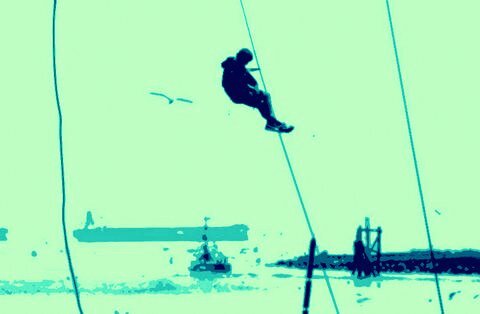 You are here: Home / Politics / MacKay jumps. Next! I’ve watched a lot of Stephen Harper speeches over the years, but the farewell speech he gave for Peter MacKay on Friday had to be one of the most bizarre. For not only was Harper strangely agitated, and managing to look both cheerful and horribly lonely at the same time. 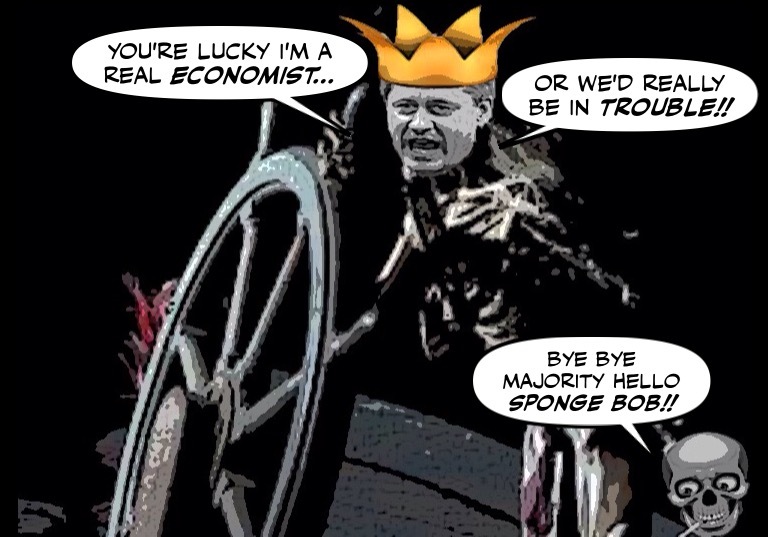 What was supposed to be MacKay’s political obituary ended up sounding like an obituary for his own government. As well it might be. Because yesterday couldn’t have been more of a disastrous day. For not only was Mackay’s sudden departure politically damaging. Even senior Conservative ministers, still reeling from an announcement most did not see coming, could not spin this one: losing Justice Minister Peter MacKay leaves a big hole in their party. 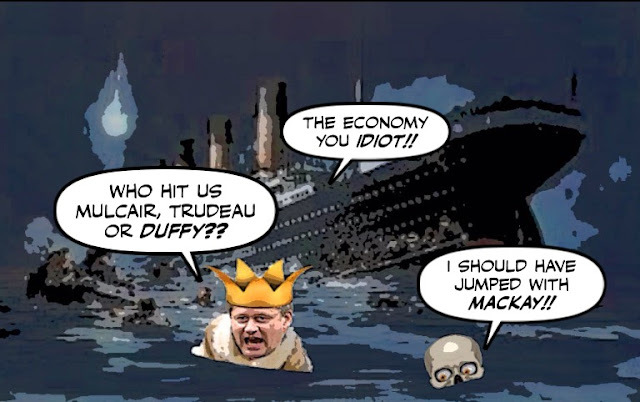 “I’m sure our adversaries are rubbing their hands with glee and talking about sinking ships and deck chairs on the Titanic and whatever other allusion they can draw,” Treasury Board President Tony Clement told CBC Radio’s The House. 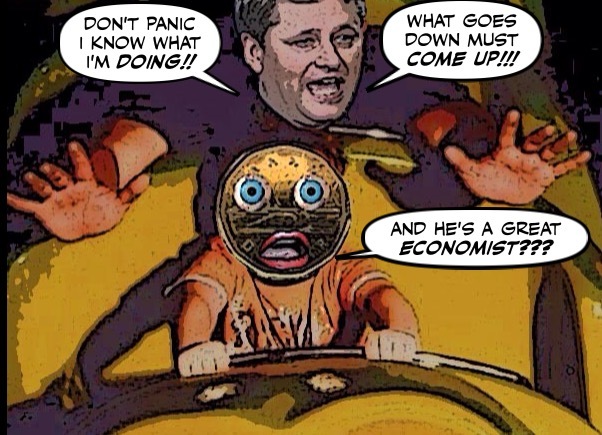 And the sight of yet another Con abandoning the Harper ship no doubt deeply discouraging . . . The timing couldn’t be worse. His prospects in Atlantic Canada are even dimmer than they were before. And the departure of the leader of the so-called Red Tories will make it even harder for Harper to win the support of others like him. Grenier points out that when the federal Conservatives are polling nationally at around 30 per cent, as they are right now, all of the so-called “Red Tories” are parking their votes elsewhere. And as Chantal Hébert points out that could be fatal. If it were not for Peter MacKay, Stephen Harper would never have become prime minister and it is an open question whether he can secure another majority mandate or, for that matter, another election victory, without him. Preventing red Tory voters from turning into blue Liberals (or taking on a shade of NDP orange) will be harder in his absence. And to make matters worse, not only does the Con ship appear to be listing, the economy is also sinking. Statistics Canada says the Canadian economy contracted at an annualized rate of 0.6 per cent in the first quarter of this year as lower oil prices halted economic growth in its tracks. The drop leaves the economy in its worst condition since the recession, according to experts. Not when it’s now painfully clear that his oily policies have driven our economy on to the rocks. And that will do to his chances of winning a majority, what the iceberg did to the Titanic. And then there was a new Ekos poll which shows that although the party standings are hardly moving, more Canadians than ever now support the idea of a coalition government. As more Canadians realize that no party is in a position to form a majority, we see rising support for both coalition government and strategic voting. In fact, these options may be emerging as the best tools to serve the interests and values of a frustrated majority. The graph above shows that Canadians’s previously strong aversion to a coalition government — which may have been critical to Mr. Harper’s late drive to a majority in 2011 — has softened dramatically. In the lead-up to 2011, voters were even divided between a preference for a Harper minority or for a coalition. 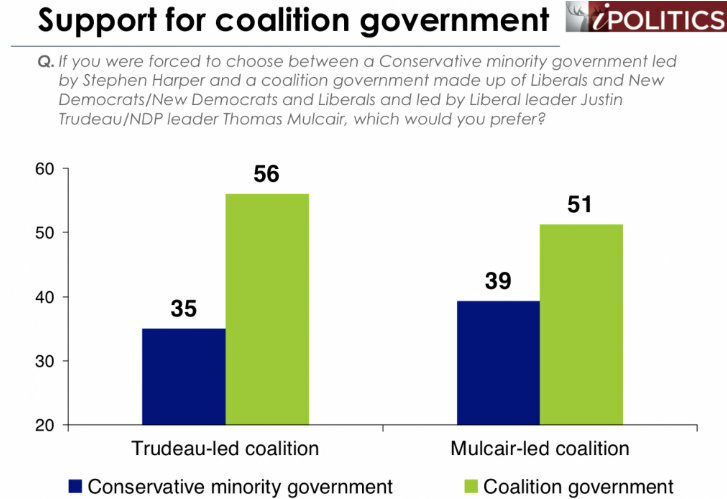 Today we see a profoundly different picture: By a margin of almost two-to-one, the voters of today would send Mr. Harper packing in favour of a coalition. Which of course also couldn’t be better news. Because it tells me that Canadians are more determined than ever to do what it takes to sink the Con regime. So while today his Cons are abandoning ship. Soon it will be his turn . . .
Now isn’t that good news? Don’t I always find something cheery to end the week? Now I think I’ll take advantage of the favourable winds and go sailing myself eh? From up there I think I can see victory in sight.